Vero Beach is located on the Atlantic Coast, halfway between Melbourne (to the North) and Palm Beach (to the South), Florida. The town is split between full-time residents and snowbirds (seasonal occupants). One of the best things about living in Vero Beach, besides the obvious, is that we have delicious eats and access to incredibly fresh seafood. Here is my 42 restaurant guide to Vero Beach, as suggested by a local. My favorite breakfast spot in town is Baci Trattoria, known for primo Italian-American favorites and breakfast dishes with a gourmet twist. Baci Trattoria’s Heaven ‘n Hell Eggs (shown below), with spicy peppers and Italian red sauce, is amazing! I cannot guarantee that your nose will not run like mad, but it is worth it. Sweet lovers may prefer the Nutella Spiedini or Chocolate Chip Pancakes. My favorite deli/sandwich shop in Vero Beach is the casual Barefoot Cafe, on 14th Avenue. Come in, order at the counter, and relax while browsing local newspapers and regional flyers. The Barefoot Cafe has impressive sandwiches, crispy salads, and wonderful homemade side dishes that are priced just right. Best choices? The Sesame Seared Tuna Salad (shown below), Caliente Sandwich (it’s spicy perfection! ), and Caribbean Shrimp Salad. Bobby’s Restaurant and Lounge is a dining spot mostly for the locals of Vero Beach. The restaurant caters to an upscale clientele and I’ve never seen anyone order anything that they said no to, even if it was not on the menu! Bobby’s is inside of the Reef Ocean Resort and the food quality is superb. I recommend the Wedge Salad, Turkey Reuben, and Belly Buster Hot Dog, which you have to see to believe. L to R: Baci Trattoria, Barefoot Cafe, Bobby’s Restaurant and Lounge. Fun and flavorful Mexican eats are found at 14th Avenue’s Blue Agave. With everything from moles to fajitas, beer, and margaritas, this is the spot that locals stop by for drinks on their way home from work. Start your visit with Blue Agave’s chunky Guacamole and Queso Fundido, followed by an uber-fresh ceviche. Located at Royal Palm Point, Cajun Cove specializes in authentic New Orleans style Cajun/Creole cuisine and does a great job of it. From Shrimp Creole to the Muffuletta, Étouffée, and Po’ Boys, this is one of the best NOLA style eateries I have had outside of Louisiana. Cajun Cove is open for breakfast, lunch, and dinner. There are also a few American dishes on the menu for picky eaters. The fresh flowers that adorn the plates are a nice touch. Locals talk about how much they love Chive, but my experience with this restaurant has only been through Chow Cab’s delivery service. Chive has the most impeccable salad choices in town and other noteworthy items such as rice bowls, wraps, Po’boys, and burritos. The concept is that you pick the ingredients you want to be included and they custom design your meal. Chive also serves beer and wine and has a nice kid’s menu. The Citron Bistro has stellar lunch and dinner options with both indoor and courtyard seating. Citron Bistro is located in the Village Shops on A1A and has a cozy atmosphere. The gourmet restaurant serves incredible dishes with top quality ingredients. My favorites include the Kale Caesar, Cobb Salad, and Fish Tacos. Citron Bistro gets my vote for having the best desserts in town. The tart Lemon Meringue Pie is worth the drive! L to R: Blue Agave, Cajun Cove, Citron Bistro. One of the premier dining spots in Vero Beach is the Citrus Grillhouse, located at Humiston Park. Oceanfront dining with chef-inspired dishes, including a special tasting menu, will delight your taste buds. Go for the daily special; if Miyazaki beef is on the list, it is a must! You will thank me. Save room for Citrus Grillhouse’s scrumptious dessert trio with your pick of 3 (how about Key Lime Pie, Chocolate Torte, and Cheesecake?) from the yummy sweet selections list. Would you like to watch private planes fly in and out of the Vero Beach Airport while you eat? You can do just that at vintage CJ Cannon’s. One of the locals’ favorite dining spots, CJ Cannon’s has an impressive menu serving breakfast, lunch, and dinner. You can’t go wrong with anything on the menu, but the dishes I am most fond of are the California Benedict, Breakfast Casserole, and Tuna Melt. Oh my, you are in for a treat! Cobalt is an upscale dining spot inside of the Kimpton Vero Beach Hotel & Spa. The restaurant has oceanfront dining and is a wonderful place to enjoy Florida Shrimp Benedict while watching the sunrise. Weekend brunch includes Red Velvet Pancakes. Happy hour is a big draw at Cobalt, with drink specials and discounted ($4-$5) trendy appetizers. Crab Stop is a newer restaurant that has won the hearts and taste buds of the locals. This no-frills eatery is no joke when it comes to incredible yet simple seafood dishes. Try the Snow Deluxe Table Combo (it’s great to share): one pound of potatoes, two corn coblets, three clusters of snow crabs, a lobster, and a dozen jumbo shrimp. Finger-licking good! It is fashionable to wear the plastic bibs at the Crab Stop… and to have butter dripping from your chin. This hidden gem, a Disney resort nestled on the oceanfront (A1A) of Vero Beach, is truly paradise. The Disney Vero Beach Resort has multiple restaurants for your dining pleasure. I would be lying if I said that the Mickey waffles were not the hottest item on the weekend brunch menu. Be sure to check out the Resort’s seasonal and character meals. L to R: C.J. Cannon’s, Crab Stop, Disney Vero Beach Resort. Who knew that Vero Beach would have a Polish restaurant? Eva’s Polish Kitchen has all of the Polish favorites, each perfectly cooked and very tasty. Though the inside isn’t much to look at, I eat at Eva’s for the food and it does not disappoint. Lunch prices run under $7 and dinners are affordable as well. Opt for the Polish plate: pierogis, soup, stuffed cabbage, sauerkraut, and smoked kielbasa. My favorite Japanese steakhouse in Vero Beach is Fujiyama, located between I-95 and downtown Vero Beach. I recommend going for lunch (lower prices, smaller portions), but anytime you choose will be a tasty experience. Select from dining on the Japanese steakhouse side or the cozy sushi bar. Order the Hibachi style Shrimp or New York Steak that comes with vegetables, fried rice, salad, and soup. You may opt to make it a combo with 2 proteins. This festive Vero Beach hotspot serves coffee by day and wine and beer with live music at night. My daughter eats a flatbread from Grind + Grape almost daily so they are doing something very right. Her favorite? The White Truffle Flatbread. Grind + Grape’s Cheese and Pretzel sticks are her other favorites, which pairs nicely with a local beer. Unfortunately, Grind + Grape does not have a menu on any of their social sites. Everyone loves wings and once you’ve had them from Hurricane Wings, it is hard to go to another restaurant. Hurricane Wings, a local chain restaurant, has plenty of other tasty eats, too, and is my favorite spot in Vero Beach for watching football games. The cold draft beer list and pub fare menu will make you a regular patron in no time. My picks? The Hurricane Chicken Salad, House Chili, Fajita Rice Bowl, or Thai Ginger and Garlic Wings. Vero Beach has many tantalizing Asian-inspired restaurants, and Izziban Sushi is another one with the most stunning contemporary decor. The restaurant is in the heart of town and has freshly rolled sushi and traditional favorite Japanese classics such as grilled meats and noodles. Chicken Teriyaki is my favorite; the best in town and super filling. Don’t skip the rich and flavorful Wonton Soup and the salad with fresh ginger dressing. I discovered Johnny D’s Market & Bistro during a book club luncheon and it quickly became my favorite spot to bring home tangy Chicken Caesar Salads for a quick and easy meal. Johnny D’s has fresh salads, sandwiches, and casual foods plus pizza and calzones. The Albacore Tuna Salad and Grilled Chicken Cobb Salad are my other favorites. If Johnny D’s happens to have Pasta E Fagioli on the menu, do not miss it. What an honest-to-goodness, wonderful soup recipe. L to R: Fujiyama Japanese Steakhouse, Hurricane Grill & Wings, Izziban Sushi, Johnny D’s Market & Bistro. One thing that Vero Beach is not lacking is delicious Asian restaurants. Kata Restaurant, in the heart of downtown, has yummy, fragrant dishes and hand-rolled sushi. The Pork Laab, Curry Puffs, Vegetable Tempura (the best tempura I’ve ever had! ), and Lobster Panang Curry top my best eats list from Kata. At lunch, Kata offers Bento boxes. The sushi and rolls are hand-rolled right in front of you at Kata. The Kilted Mermaid has the coolest, most original menu options in Vero Beach. This artsy eatery has live music, poetry, craft beer, wine, and fondues plus kilted servers. I do not think it looks like an upscale restaurant, but the Kilted Mermaid’s food quality proves otherwise. Start with Mushroom Empanadas or Cuban Flatbread and finish off the evening with a Coq au Vin Sandwich. Fondue lovers should try the Spicy Sausage Fondue and then move to the Heath Bar option for dessert. Kilwin’s is a chain (108 at the moment) that is everything you want in an ice cream parlor and ten times more! This palate-pleasing specialty ice cream shop serves typical cones and sundaes but also has fresh baked cookies, apples, fudge, gourmet candies, truffles, and gift items. Kilwin’s caramel sauce (you can purchase in a jar) is to die for and when in season, the Caramel Apple Pie Sundae will knock your socks off. My favorite flavors are the Salted Caramel (tiny chocolate covered pieces of ooey gooey caramel inside) and New Orleans Praline Pecan. L to R: Kata by Sake, Kilted Mermaid, Kilwin’s. Lemon Tree is a favorite spot, only steps from the beach on Ocean Drive. The upscale comfort food and scrumptious breakfasts keep the crowds coming back. I recommend the Eggs Benedict and Chicken Pot Pie, but the Lobster Salad is quite intriguing as well. Lemon Tree is a place you can take friends or family for a special occasion with high-end food in a casual setting. This Old School eatery has whimsical filling station memorabilia and yummy breakfast options. The biscuits and gravy are some of the best in town, while the pancakes are light and fluffy. Omelets are named after cars, such as the Doozy, G.T.O., Hot Rod, and Sportster. Mrs. Mac’s Fillin Station also serves lunch and dinner. Perhaps the biggest tourist draw in Vero Beach is Mulligans Beach House, an oceanfront eatery with American cuisine, great bar drinks, and the cutest bartender in town, my daughter Peyton. Whether it is breakfast, lunch, dinner, or cocktails you are craving, Mulligans has them all. Sip cocktails while sitting in a colorful chair on the beach or dine on the covered patio. My food picks are the huge and perfectly fried Fish & Chips and Mulligan’s Spinach Benedict, topped with a creamy and cheesy spinach dip spread rather than sautéed spinach. The tastiest Italian gig in town is located beachfront and has quality pasta dishes with side salads for less than $20. Nino’s Cafe’s menu consists of NY style pizza and Italian entrees. I love Nino’s Fried Ravioli while the decadent Cannelloni is an ultimate dinner choice. Gnocchi Gorgonzola and Veal Parmigiana are other fabulous choices. The drawback: they only take cash. There are two other Nino’s locations in town but this one is the best and they offer different menus. The Ocean Grill is a classic steakhouse with fresh seafood on the oceanfront. It is a must-visit while vacationing in Vero Beach. Go for lunch to have Lobster Rolls or Quiche and stay for dinner to feast on succulent steaks and a smorgasbord of fresh fish dishes. A small bar is located at the back of the restaurant if you want to escape the crowds. The Crab Dip and Peel & Eat Shrimp are the perfect accompaniment for a cold beer or glass of wine. A popular happy hour and hang out spot in Vero Beach is at the Orchid Island Brewery. OIB serves craft beer, cider, and delicious farm-to-table fare from a gourmet chef. The brewery’s atmosphere is relaxed; not one bit pretentious as many craft breweries are. I love the Pimento Cheese and MT’s BLT Salad, while the ciders are toothsome and satisfying. A live band plays most nights. Another crowd-pleasing sandwich shop, is Penny Hill Subs, found at the beginning of our famous Miracle Mile. Billowy bread, choice cold cuts, homemade sauces, and a friendly staff make this a great option for grabbing a quick lunch or dinner. The Rancher (roast beef & bacon) and Monte Carlo (turkey, bacon, Swiss) are my go-to items with an extra slather of their wonderful cherry-pepper relish. L to R: The Lemon Tree, Mulligan’s Beach House, Ocean Grill, Penny Hill Subs. The Red Onion, on Ocean Drive, serves up fresh and tasty sandwiches, salads, and the best lobster rolls in town. This eatery is always bustling with a crowd because they continually serve good quality meals. The Crunchy Grouper Reuben is a wonderful choice, paired with their hand-cut chips. Fancy a side of bleu cheese dressing for dipping or fresh bleu cheese crumbles on your chips? Go for it! The biggest surprise in Vero Beach is the Rio Coco Beans & Cafe, in the industrial part of town. Rio Coco Beans has impressive smoothies, teas, coffees, sandwiches, salads, rice bowls, and more. This non-profit family-owned company is on a mission to support a children’s school in Honduras with their missionary project. I love the Asian inspired rice bowls. The prices are affordable while the coffee (beans roasted on site from around the world) is second to none in the area. Located on the Indian River Lagoon and under the Merrill Barber Bridge, this popular and lively eatery has the best burgers in town. Riverside Cafe has a late-night DJ, big screen TVs, and serves as country music star Jake Owen’s stomping grounds when he visits his hometown. The best things to order, other than burgers, are the Chicken Quesadilla, Catch of the Day (I prefer mine blackened), and Ahi Yellowfin Tuna. Riverside Cafe has plenty of free parking and is very relaxed. L to R: Red Onion, Rio Coco Beans & Cafe, Riverside Cafe. Another good choice for Greek eats (and Lebanese, too!) is Sammy’s Mediterranean Cafe in downtown Vero. Sammy’s cooks up crowd-pleasing dishes and serves a nice selection of wines, finger-licking pastries, and daily specials. The staff is super friendly and the atmosphere is relaxed. Dishes that I recommend are the Caramelized Cauliflower, Fatoush, and Beef or Chicken Shwarma. I enjoy the shabby chic decor of this restaurant. Siam Orchid Thai & Sushi is a delicious Asian restaurant with killer sushi and lunch specials. I always opt for a Masaman or Chicken Panang Curry Bowl or the Dragon Chicken. Save room for a yummy Thai tea. Everything I’ve tried has been exceptional and is just the right amount of food. Keep in mind that Siam Orchid closes between lunch and dinner times. L to R: Sammy’s Mediterranean Cafe, Siam Orchid. Our trendy and hipster eatery in downtown Vero Beach is Southern Social Kitchen & Bar. The impressive cocktail presentation and fantastic Southern-inspired appetizers will have you salivating in no time. The food at Southern Social is the most Instagram-worthy in town. Don’t miss the upscale Deviled Eggs (candied bacon and chives! ), Pimento Cheese Fritters, and Chicken and Waffles. Spiro’s Taverna serves zesty Greek eats. The menu includes all of the traditional Greek favorites (such as Gyros, Moussaka, and Spinach Pie) as well as non-Greek dishes (wraps, salads, and more). Spiro’s Lemon Soup is a real treat; thick and tangy goodness. I recommend the Souvlaki and Greek salad. If you are in the mood for Asian food, the Sumo House serves some of the best in town. It is incredibly popular for lunch because the restaurant offers lunch pricing for smaller portions. I Sumo House’s Thai menu, but recommend the Red Curry Chicken, Wahoo Miso Salad, and exotic Salmon Roll. Brown rice is available upon request. The Taco Dive in Vero Beach is THE place for tasty dishes at affordable prices. The street tacos (Pork & Pineapple shown below) are filling and less than $5 each. My favorite thing on the menu is the Smothered Tots—a sinful dish—drowning in queso fondue with fresh jalapeños. L to R: Spiro’s Taverna, Sumo House, Taco Dive. A popular local chain eatery, TooJay’s is an original gourmet deli with a huge menu. The on-site bakery and deli bar are great options for taking home a meal or sandwich essentials. I find their omelets to be some of the best in Vero Beach. Replace your side dish (fruit, home fries, grits) with TooJay’s crispy potato pancakes or try the yummy Tuna Salad Melt for lunch. Waldo’s is the on-site restaurant at the historic and funky Driftwood Hotel on Ocean Drive. The restaurant decor is interesting and unparalleled, while the food is fresh and consistently delicious. This is a great spot to take large parties for oceanfront dining. Live music is offered on weekends. My go-to dish is the Travelers Shrimp: coconut, fried, and Monterey Jack stuffed shrimp, fries, and your choice of coleslaw or pasta salad. The rum bucket drinks are a must! When I am craving a quick Italian meal, The Italian Kitchen is my go-to choice. Delicious pasta dishes, affordable and flavorful New York style pizzas, buttery garlic knots, and supreme service make this restaurant one that I gladly recommend. My family loves the pizza while I opt for the Chicken Parmesan (sub-Alfredo for red sauce) or the Combo Special with a little bit of everything (cheese ravioli, lasagna, stuffed shell, ziti, and meatball). Bonus, Italian Kitchen sells pizza by the slice. One of the luxury hotels in Vero Beach belongs to singer Gloria Estefan and her husband. The Wave Kitchen & Bar is located in that hotel, the Costa d’Este Beach Resort & Spa. Cuban-inspired dishes mostly dominate the menu. The prices are high but the food quality is top-notch. My favorite dishes include Salmon and Ahi Tuna Poke, Cuban Black Bean Soup, and Ropa Vieja (shredded beef). Sweet lovers like my mother will prefer brunch’s Buttermilk Pancakes, French Toast, and Sweet Crepes. L to R: Waldo’s Restaurant, The Italian Kitchen, The Wave Kitchen and Bar. Vero Beach is not without a finger-lickin’ Southern-style style barbecue establishment. Wilke’s 14 Bones Bar-B-Q has all of your barbecue needs including pulled porks, ribs, Texas beef brisket, and smoked chicken. Tasty side dishes include green beans, cheese grits, Texicorn, corn-on-the-cob, and collard greens. Try the Garlic Parmesan, Formula 14, or Sweet Old Fashion BBQ sauces. Vero Beach has a culinary offering for every taste you desire. Whether you crave authentic Italian food, fresh seafood, or gourmet deli meats, we’ve got you covered. 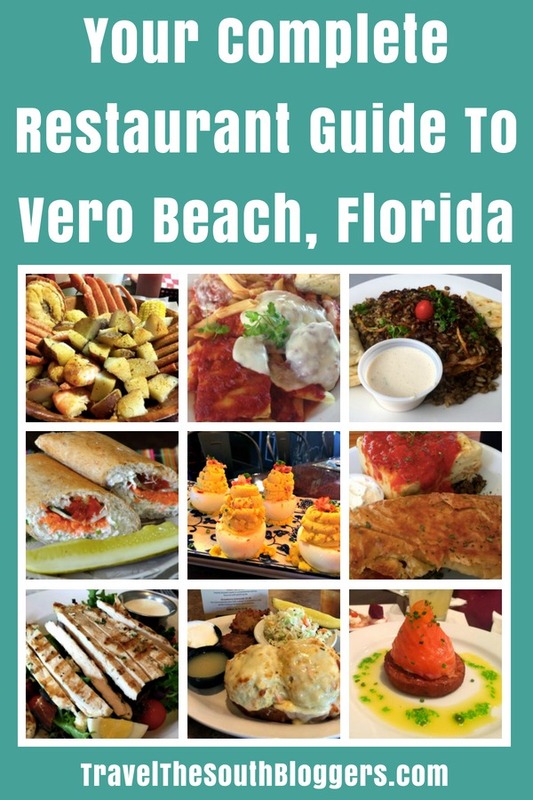 Be sure to check out our restaurant guide to Vero Beach, Florida often as we add new restaurants as they come to town.